The following introduction is an update from our 2011 review of the MIT Media Lab identity change on the heels of its 25th anniversary: Founded in 1985 by MIT (Massachusetts Institute of Technology) Professor Nicholas Negroponte and former MIT President Jerome Wiesner in an I.M. 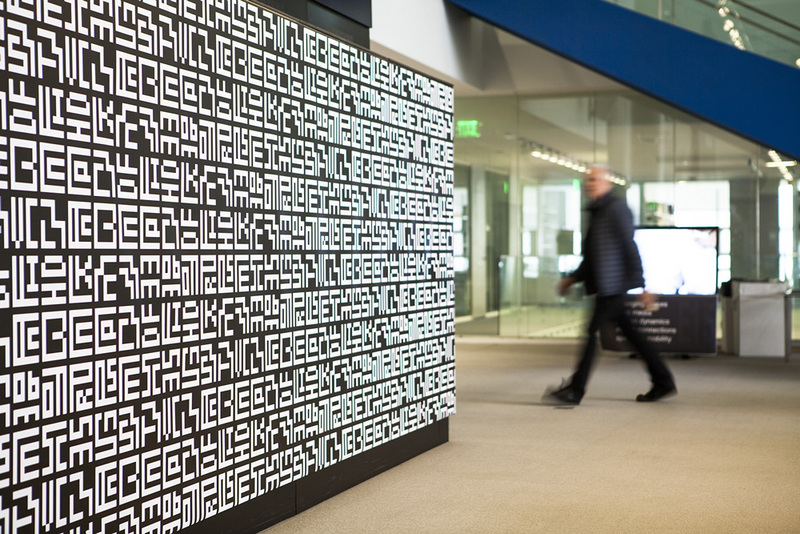 Pei-designed building, the MIT Media Lab is one of the world’s most renown research and development centers. Funded by corporate sponsorship, the Media Lab counts with an annual operating budget of approximately $45 million and served 146 graduate students and 28 faculty and principal investigators in 2013 – 14, who work in more than 25 research groups on more than 350 projects that range from “digital approaches for treating neurological disorders, to a stackable, electric car for sustainable cities, to advanced imaging technologies that can ‘see around a corner.’” Earlier this month, the Media Lab introduced a new identity by Pentagram, headed by New York, NY-based partner Michael Bierut. [The] team in Cambridge […] had a question. 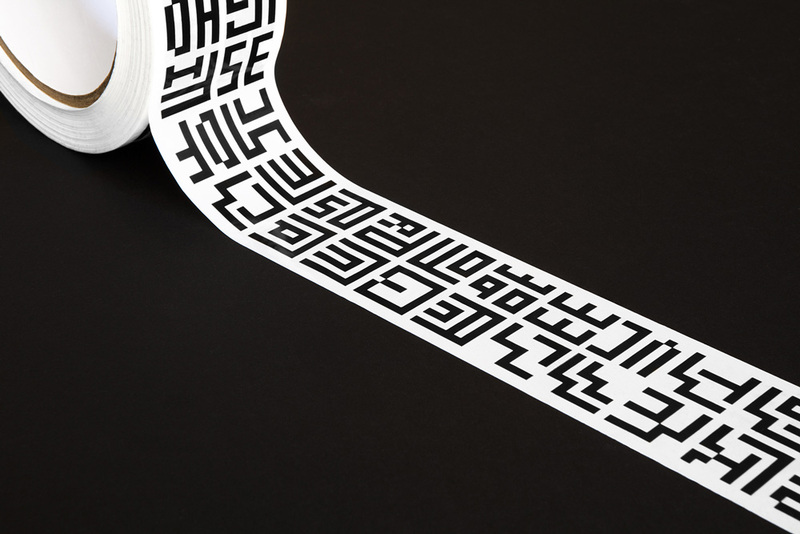 Could a new MIT Media Lab identity combine the two traditions of timelessness and flexibility? 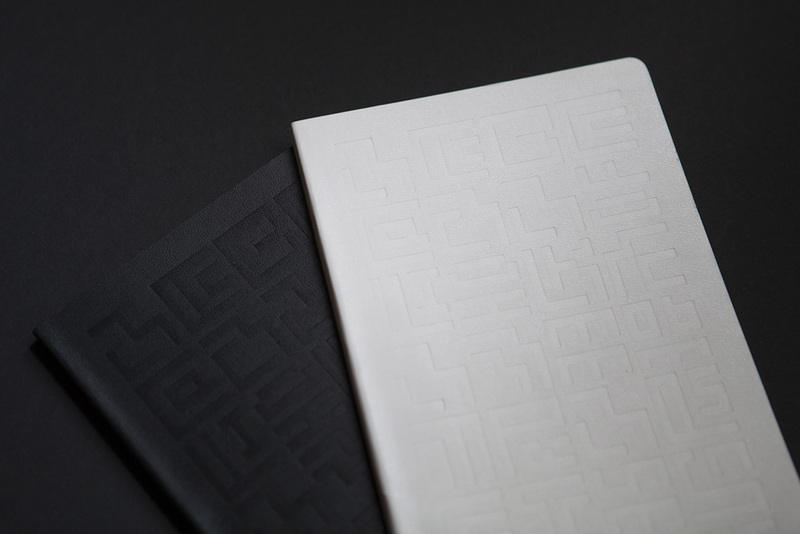 The answer proposed by Michael Bierut and Aron Fay started with Richard The’s anniversary logo, which was based on a seven-by-seven grid. 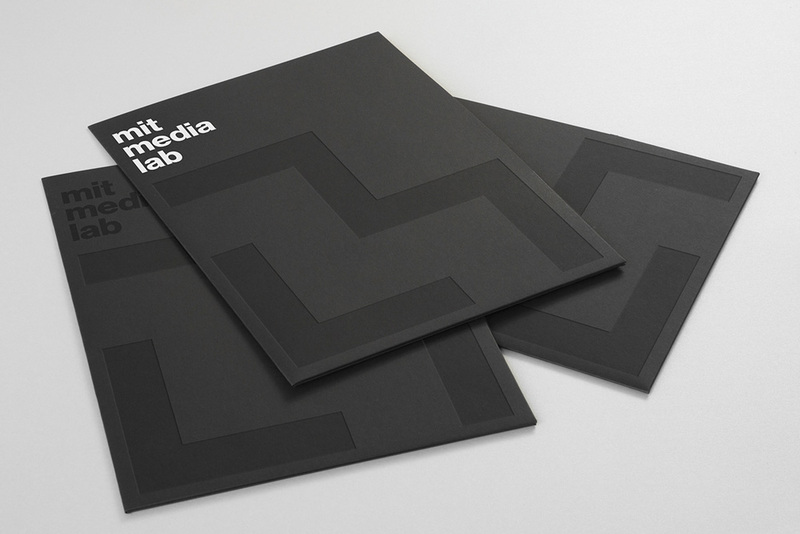 Using that same grid, the Pentagram team generated a simple ML monogram to serve as the logo for the Media Lab. Then Bierut and Fay, using the same underlying grid, extended that identity to each of the 23 research groups that lie at the heart of the Lab’s activity. 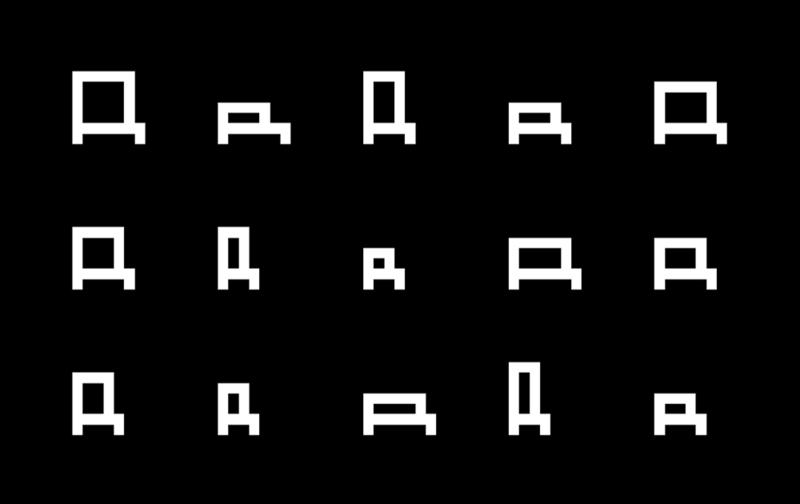 The result is an interrelated system of glyphs that at once establishes a fixed identity for the Media Lab, but celebrates the diversity of activity that makes the Lab great. Helvetica, so central to MIT’s communications when the Media Lab was new, has been reinstated to support the overall system. Animation showing how the new logo uses the same grid as the previous logo. The previous logo, designed in collaboration by E Roon Kang and TheGreenEyl was fairly well received back in 2011 mostly because of its unexpected and irreverent approach that allowed for thousands of permutations. As a logo-logo, however, it wasn’t the most functional. Yearning for an MIT Press-like logo without losing the flexibility of its existing identity, the Media Lab’s new identity successfully marries both. A few different ways of using the logo for different initiatives or programs. 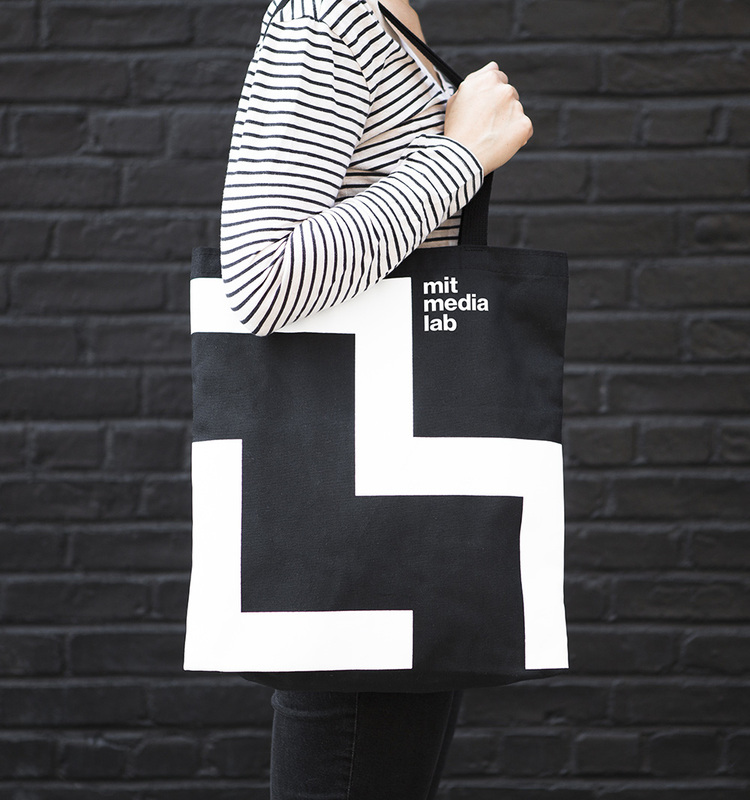 Not as elegant — and I doubt that was the intention or goal — as the MIT Press logo, the new Media Lab logo is very similar to it as an acronym that demands interpretation, hiding an “ML” in the strangest of ways, with a 45-degree “M” and a small “L” tucked under it. (Arguably, it reads “LM” more than “ML”.) It’s not a beautiful logo, it’s almost off-putting in its jarring letterforms but as the visual foundation for the Media Lab’s multiple research group at the core of its academic structure, it’s perfect: a gateway into a world of twisted, nerd-encoded acronyms that future generations will puzzle over as artifacts of past civilizations. Or something. 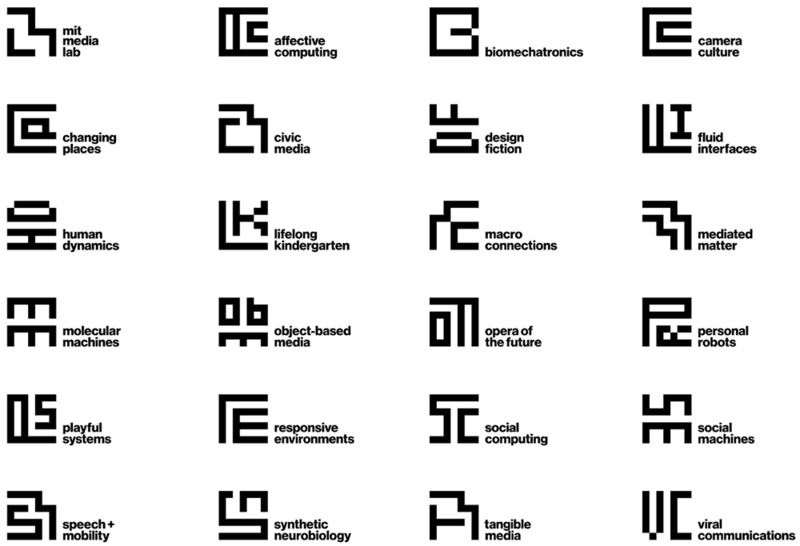 A wide range of acronym logos for each of the Media Lab’s research groups. Animation showing the new logo and research group acronyms. 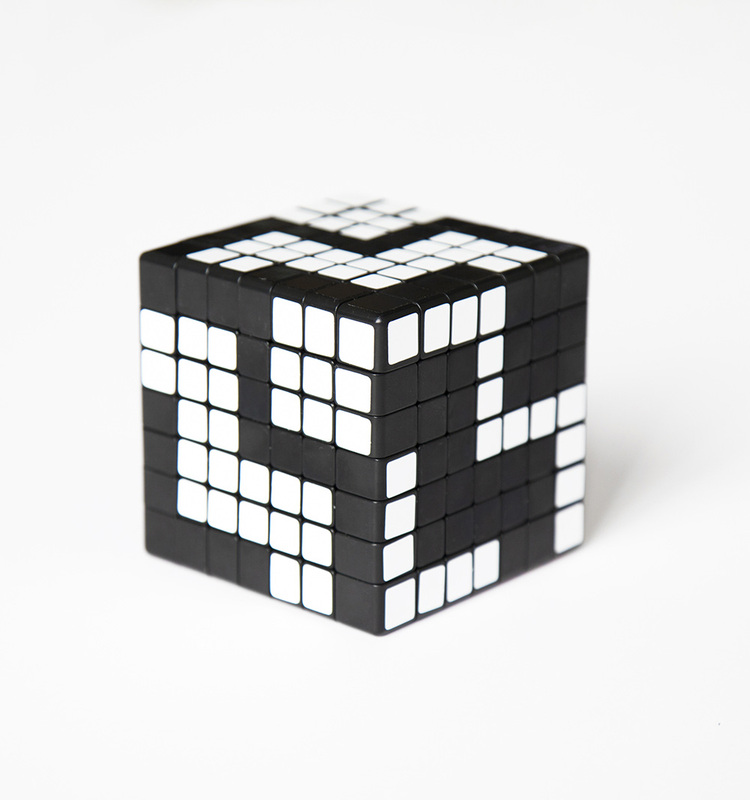 The playful yet strict letter pairings on a 7 × 7 grid deliver some remarkably interesting and entertaining combinations, that would be impossible to figure out were it not for the small descriptor to their side. (In Helvetica, natch). This visual language also sets the tone for a highly flexible range of applications and future permutations of the identity that will look and feel the same without having to be the same. 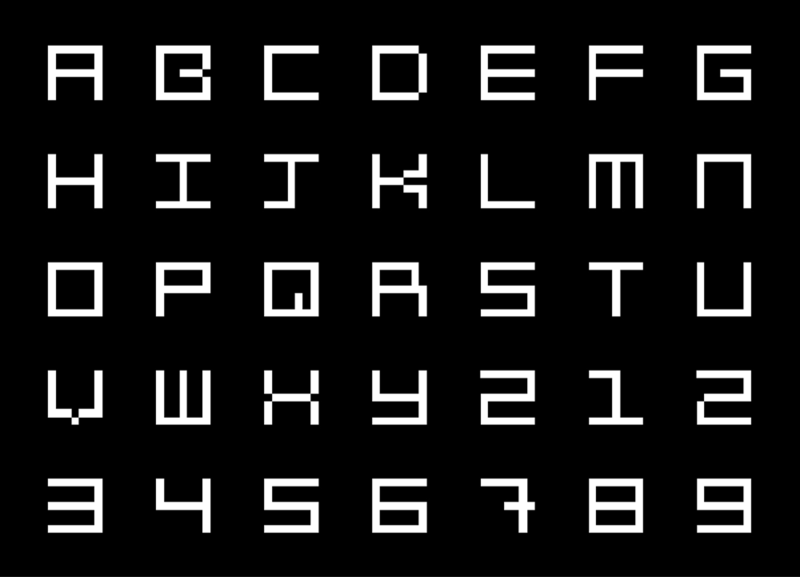 The main typeface built on the same grid as the logo. 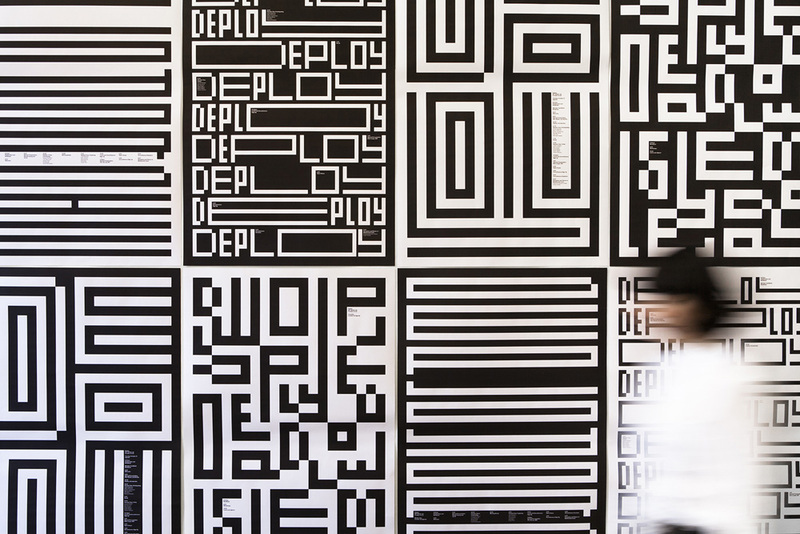 The new identity was unveiled at the Media Lab’s Fall Members Meeting, which was organized, appropriately, around the theme of “Deploy.” To celebrate that theme, [Pentagram designer] Aron Fay extended the identity’s visual language with multiple expressions of the word. The result was a not only a debut of a new identity, but a real-time demonstration of that new identity’s endless potential. Posters for Media Lab’s Fall Members Meeting, themed and titled “Deploy”. Media Lab Rubik’s cube because nerds. Applications like the “Deploy” posters show the unlimited directions in which this identity can go while certain recurring moves — like the edge-to-edge logo use on the welcome screen display and tote bag — establish consistency. Overall, this is an unconventional logo and identity for an unconventional institution that has yielded an eccentric yet rule-based system for the Media Lab. The following introduction is an update from our 2011 review of the MIT Media Lab identity change on the heels of its 25th anniversary: Founded in 1985 by MIT (Massachusetts Institute of Technology) Professor Nicholas Negroponte and former MIT President Jerome Wiesner in an I.M. Pei-designed building, the MIT Media Lab is one of the world’s most renown research and development centers. 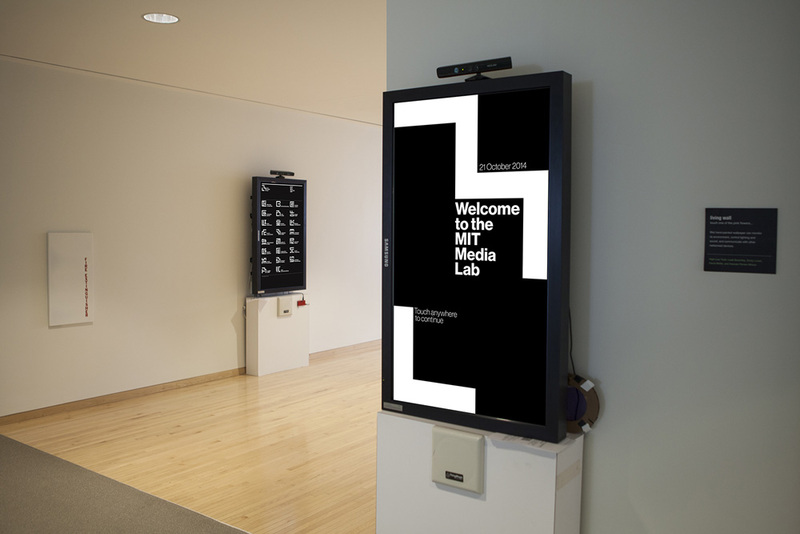 Funded by corporate sponsorship, the Media Lab counts with an annual operating budget of approximately \$45 million and served 146 graduate students and 28 faculty and principal investigators in 2013 – 14, who work in more than 25 research groups on more than 350 projects that range from \"digital approaches for treating neurological disorders, to a stackable, electric car for sustainable cities, to advanced imaging technologies that can 'see around a corner. 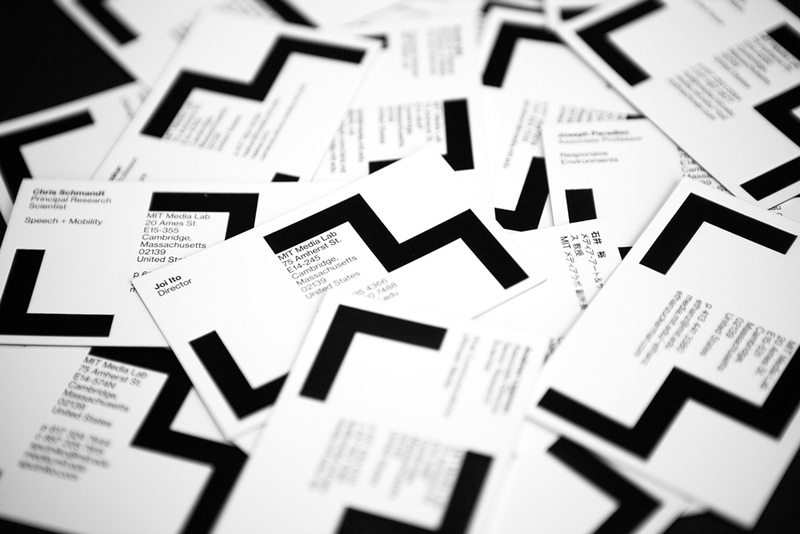 '\" Earlier this month, the Media Lab introduced a new identity by Pentagram, headed by New York, NY-based partner Michael Bierut.